I got interested with this article because it happens to be that the first National Men’s Single Champion is a Filipino, my fellowman. So I wanted to give a mark of respect to that person. You can see the names listed as the Roster of National Champions. You can see the name of the first person…….. “ ADRIANO G. TORRES JR.”. That’s the person I’m talking to. I just want my reader to be aware of all the accomplishments and a brief background knowledge of the life of Adriano G. Torres Jr. LOOKING AT THE fifty’s Adriano Torres Jr. now won’t betray the fact that during his heydays, he was the undisputed badminton king-pin in the Philippines. Except for a handshake that lets you feel a firm grip, you wouldn’t have any idea that Mr. Torres was an athlete, and still is. He is limping when he walks, a result of rheumatoid arthritis that forced his retirement after what’s perhaps the most illustrious career hereabouts in his field. Still, a look at the record books gives proof of what most everybody doesn’t know. He was the most dominant figure in badminton in the ‘50s, being the national singles champion for seven years in the period spanning 1949 to 1958. 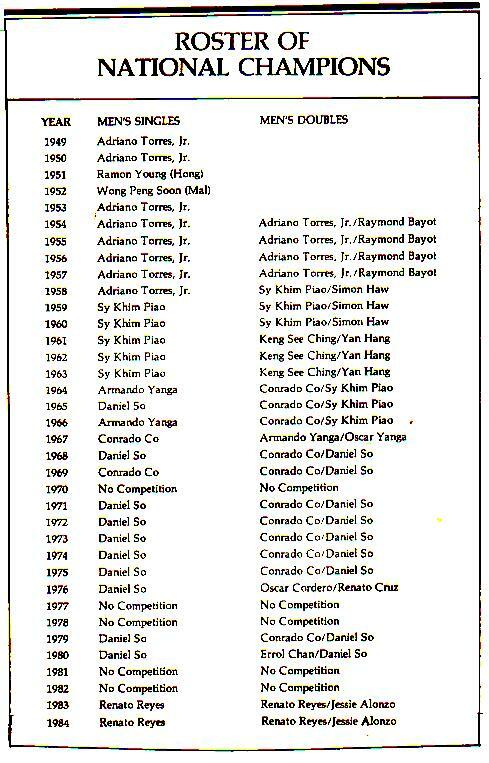 He was the mixed doubles champion with Consuelo G. Paredes in 1953, and reigned as doubles kingpin with Raymond Bayot from 1954 to 1957. His exploits took him to such foreign lands as Hong Kong, Taiwan and Japan. Indeed, nobody before his retirement and since has come out and appeared capable of duplication Torres’ feats. Even Torres himself has a similar view. Without a trace of being egoistic, Torres says that the current crop of badminton stars does not have a single individual standout. “Everybody is about on the same level,” he says. 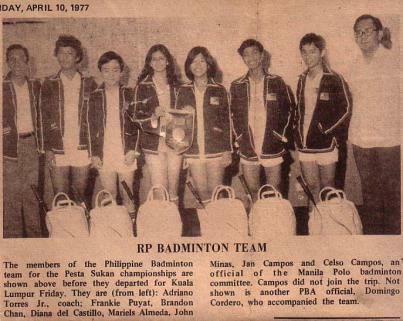 Domingo Panganiban, his partner on the local badminton team, observes that Torres is in a class all his own. “ His winning is really different,” Panganiban says. Torres has been with the System even before he became national champion. He joined the then-Metropolitan Water District as a casual employee in 1947. 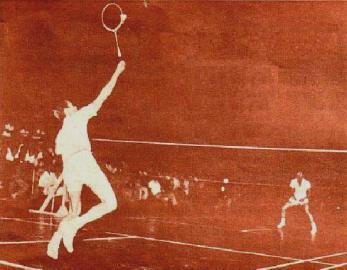 Because of his badminton prowess, the System held sway in tournaments it joined like the national open, metropolitan open and the GCAA, which was born about 1958. Torres, in between smashing shuttlecocks, was also working and studying, once taking up architecture which he wasn’t able to finish due to his numerous pursuits. He worked himself in to a decent position in the System. He was assigned at the Property Division sometime in the ‘50s, then at the Administrative Division (the current Property) doing clerical jobs later. In the mid-‘60s, he was transferred to the Collection Department as a batcher, before being assigned as a serviceman at the Sampaloc Branch some 15 years ago, a position he holds to this day. His stint as a branch man has been his longest assignment, and he figures to perform his job of investigator up to his retirement from the service. Unfortunately, Torres was not lucky enough to have a son. He and his wife of almost 28 years, the former Erlinda Arguelles, were blessed with three children, all girls. The eldest, Erlinda is already a full-fledged CPA, and has a five-year-old son. The second, Ester, and is entering her third year proper in medicine. Rosario, the youngest, is a commerce graduate who majored in accounting. Torres is also preoccupied with imparting his knowledge to younger players. Since his retirement from competitive play on the national level, he has been coaching and teaching youngsters. A recognition of his value as tutor was his being named as head coach of the national team for 18 years and under to the Genting Highlands Pesta Sukan in 1977, and his appointment as coach of the second national pool last year. He prides himself in having turned out his own flock of young stars. Among them are women’s champion Martha Millar, her brother Marty, a former national open semifinalist, onetime women’s national finalist Helen Uy, and national women’s players Irene Viola and Sandy Prieto. It would appear that whether it’s on or off the court, Adriano Torres Jr. is one of those people who have made the best of themselves. Truly, that’s more than a handful of what you can say about some people. 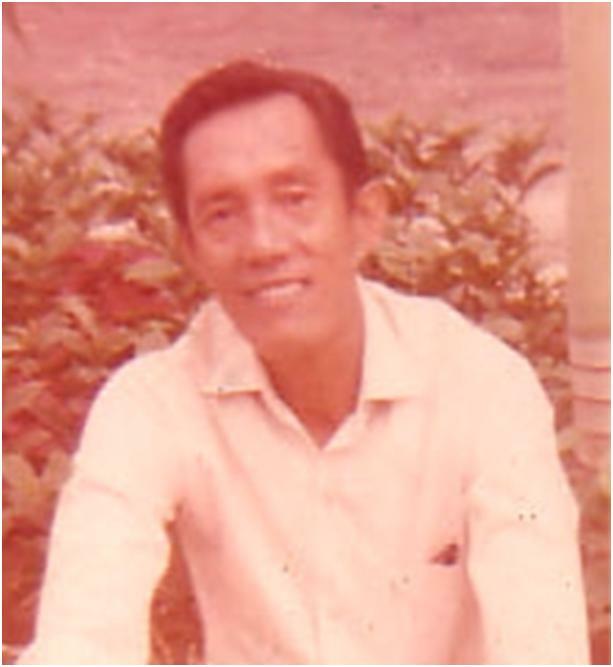 He died in Manila last January 11, 1997. He is special to me. Take a bow, Adriano Torres Jr.
DO YOU KNOW WHY HE IS SPECIAL TO ME ? YOU CAN CONTACT ME THROUGH MY EMAIL lucky_pari23@yahoo.com or askpari@gmail.com. THANK YOU FOR YOUR COMMENT. I APPRECIATE IT. VISIT MY BLOG AGAIN.